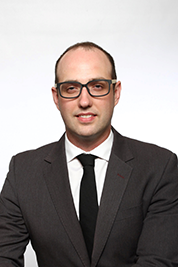 Jeremiah Kalyniak is an associate lawyer at Langevin Morris Smith LLP. Jeremiah’s focus is family law and wills and estates. He holds a diploma in corrections, a Bachelor’s Degree in Social Work from Carleton University, and a Juris Doctor degree from the University of Ottawa. Jeremiah was awarded the Senate Medal for Outstanding Academic Achievement for his undergraduate work, was a member of the Dean’s Honours List in law school, and was awarded the RavenLaw prize for his top performance in human rights law. Jeremiah has always been interested in family law. He studied family law during law school, was a member of the Family Division at the University of Ottawa Community Legal Clinic, and articled with two experienced family law practitioners in Ottawa. Prior to law school, Jeremiah was a social worker at the Canadian Mental Health Association in Ottawa, where he also assisted individuals and families. Currently, Jeremiah works primarily out of our Renfrew and Ottawa offices, and has a particular interest in military separation and divorce. Jeremiah is open to working toward amicable resolution when possible but is also more than happy to litigate, including bringing matters to trial. Outside of law, Jeremiah enjoys spending time with his wife and child. He is also an avid woodworker. Most recently, he built a walnut dining room table to accommodate his growing family.